You can drag a Package element from the Project Browser onto the current diagram, to show an icon of the Package containing a list of the Package contents. This is a useful feature to help organize the display and documentation of models. 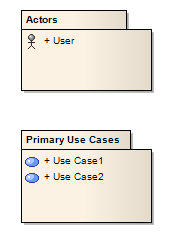 In this illustration, note the child Actor and Use Case icons.